Members of the TaxSlayer Gator Bowl Dream Team uncap pens as they get ready to sign documents to serve as representatives and ambassadors for the TaxSlayer Gator Bowl Aug. 28. 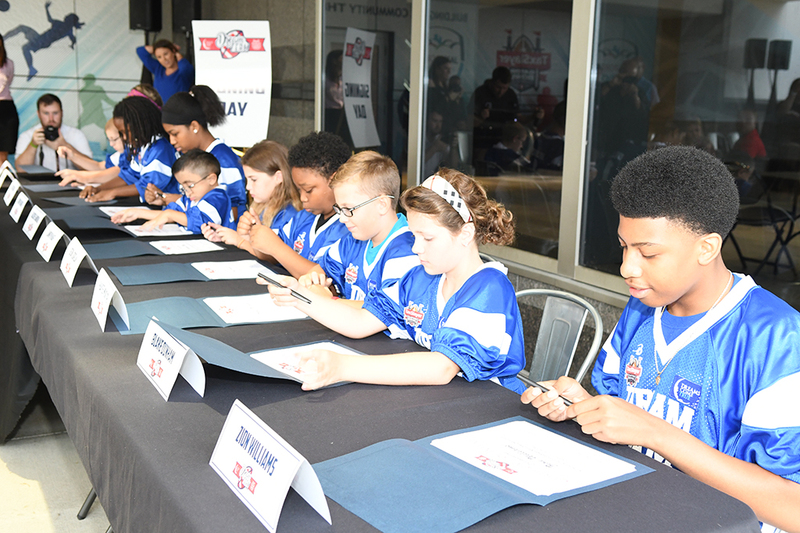 The TaxSlayer Gator Bowl and Dreams Come True signed participants of Dreams Come True to the TaxSlayer Gator Bowl Dream Team Aug. 28. 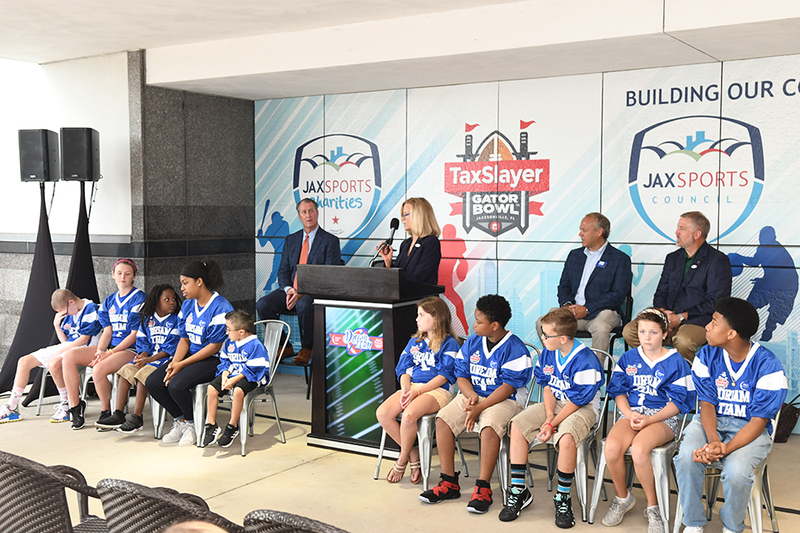 The dreamers will serve as representatives and ambassadors for the TaxSlayer Gator Bowl through their participation on the Dream Team. Throughout the college football season, the Dream Team will have the opportunity to scout a game at the University of Florida, participate with local corporate executives at monthly TaxSlayer Gator Bowl meetings, distribute their rookie year player cards throughout Jacksonville, and will be highlighted individually on social media and the TaxSlayer Gator Bowl website. At the conclusion of the college football regular season, the Dream Team will graduate from their Dream Team jerseys to TaxSlayer Gator Bowl green jackets officially making them honorary Dream Team members of the TaxSlayer Gator Bowl committee. Their Dream Team experience will include a meet and greet with participating team players and cheerleaders in the Dreams Come True Room at Wolfson Children’s Hospital in late December and conclude with being honored on-field during the 74th annual TaxSlayer Gator Bowl on Dec.31, 2018. The 2018 Dream Team includes Jake Berglund (13), the Yulee High School and Middle School Mascot; Blake Dunham (9), St. John’s County loves the Florida State Seminoles; Jordyn Harris (13) representing Ortega and is on the mend after surgery to repair an atrioventricular septal defect; Deon Jordan (age 17), representing Camden County, roots for the Florida Gators; Hayes McIntyre (11), of Yulee, is partial to the Ohio State Buckeyes; Camryn Naff (10), representing Intercoastal West, said the Georgia Bulldogs is her favorite college team; representing Jacksonville’s Northside, Jacob Sandoval (11) has brittle bone disease and roots for the New England Patriots; Jacob Shedlin (13) represents St. Johns County and is a Clemson Tigers fan; Tallahassee resident Norah Sproles (6) was born with the most severe form of spina bifida; King Tatum (7), from the Northside, loves the Jacksonville Jaguars; Payton Titus (17), from Arlington, is a Florida Gators fan; and Florida State Seminoles fan Zion Williams (15) represents the Westside.